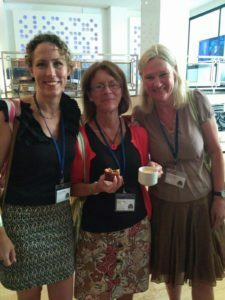 Fiona, Hazel and Stroma managed to catch up at the conference. The annual Critical Tourism Studies Conference once again brought together many inspiring researchers, practitioners and advocates to discuss topical trends and developments in tourism around the world. Held from 25 – 29 June in Palma de Mallorca, Spain, the event called for “understanding tourism – changing tourism“, and on us all to understand ourselves and change our behaviour accordingly. We were pleased that no less than three of our Associates had been invited to share their insight at the event – Hazel Tucker was providing the keynote address and Fiona Bakas and Marina Novelli were participating in two of the Monday sessions. Our very own Stroma Cole had travelled to the Balearic island to present her paper ‘Empowered or Burdened?’ – arguing that giving women jobs is not the same as empowering them.